SNES Mickey Mania: The Timeless Adventures of Mickey Mouse (JPN) in 16:34.28 by EZGames69 & Sonikkustar. Mickey Mania: The Timeless Adventures of Mickey Mouse is a 1994 platformer video game developed by Traveller's Tales and published by Sony Imagesoft for the Super Nintendo Entertainment System, Sega Genesis, and Sega CD. 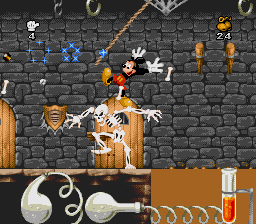 In the game, the player controls Mickey Mouse, who must navigate through various side-scrolling levels, each designed and based from classical Mickey Mouse cartoons. In this run, the authors abuse a glitch intended by the developers that allows you to bring up a “Level warp” from spawning too many sprites on the screen, beating the game in record time. If you would like to watch the TAS of the Genesis version, click here.